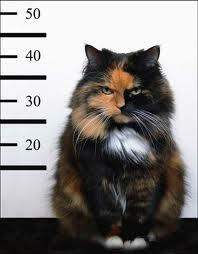 In a variety of ways, cats are going to prison these days. Cats in prison? There are cats that are guilty -- guilty of murdering innocent mice and birds, of assaulting their owners, total strangers and each other, or of stealing a quick snack from the human's meal when no one was looking. However, it hardly seems like a good reason to put them in prison, yet prison is w here some of them have landed. While some people out there who think that a prison or jail is just where a cat ought to be, these tend to be cat-haters or over-zealous dog lovers. The reality is that more and more penal systems are learning the advantages of placing a cat in a cell with a human inmate. Despite what some may think, this is not a punishment. For one jail in Nebraska, it was as simple as adopting a couple of cats to help the inmates while away the hours in a healthy manner. The inmates are solely responsible for the care of the cats. The work is divvied up between the cats. One is on duty with the work release area, while the other is one patrol in minimum security. In an unusual and highly unlikely twist of fate, inmates are lining up for a turn at cat care, even if that means having to don hazmat gear to clean the litter box. Cats with socialization and/or behavioral issues have a difficult time adapting to life in an adoptive home. Animal shelters are increasingly sending these felines off to the Big House in cat rehabilitation programs. They will be assigned to prisoners who have the time to spend with these cats and give them the love and attention they need to heal and become rehabilitated. It is a two-way street. The cats provide the unconditional love and trust that many of these inmates need. According to prison officials, having the cats around help alleviate the stress of being incarcerated for these prisoners. To a certain extent, this must become a labor of love for the prisoners selected for the program. When you live in such close quarters with someone, you have to be willing to forgive someone who is going to pee in your shoes if they get upset. This is most likely the origin of the term "pissed off." In other programs, it is the cats that are healing the inmates in maximum security programs. Most of these prisoners are in for murder. The cats are said to have changed the lives of these men. The love of a good cat can quell anger, relieve stress, and help them get in touch with their soft side. Cats, as usual, don't care what these men have done, just so long as the food dish is filled, the litter box cleaned once in a while, and they get a warm body to curl up with at the end of the day. There has been no word as to whether convicted cat burglars have been allowed to participate in the programs, nor have any studies been done to determine if these cats reduce the rate at which parolees re-offend. Since the cats would be homeless or even on death row themselves, they seem to think that this arrangement is just purrrr-fect.